The Cassini mission to Saturn might have burned up in the atmosphere after observing the gas giant and its moons for thirteen years, but the science has not stopped. The vast amount of observations collected by Cassini from the scientific payloads are expected to continue to provide insights to researchers for decades into the future. 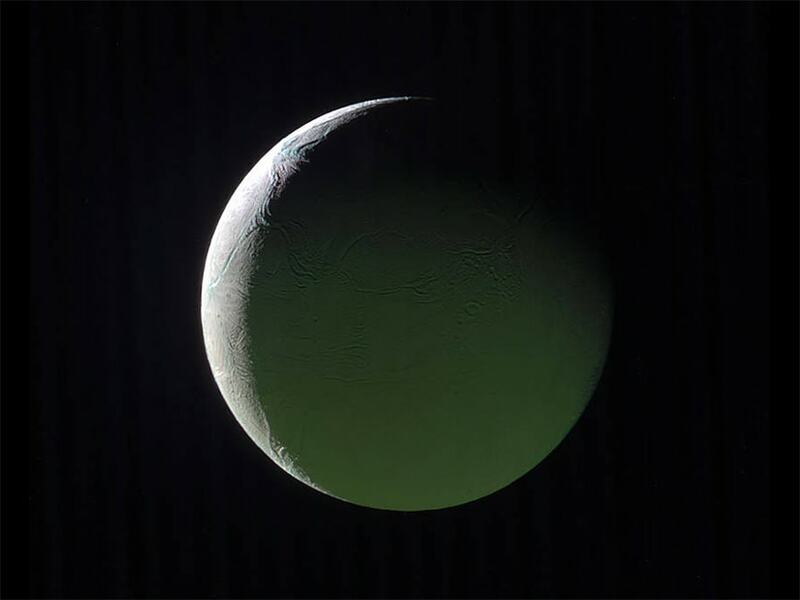 NASA has now released an image of Enceladus, a moon of Saturn, with the sun lighting up a bright crescent limb. The image was captured on 29 March 2017, at a distance of 180,000 kilometers from the moon. Conspicuously missing from the image are the jets of water that erupt from a region near the south pole of the moon known as the tiger stripes. The spouts of water are hidden by the moon itself because of the angle at which the spacecraft captured Enceladus. Scientists had no idea that the water erupted from the moon when the Cassini spacecraft was designed, which is why the instruments on board did not have the necessary instruments to study the jets in detail. However, Cassini glided through the geysers and conducted some scientific observations, paving the way for future follow-up missions that could unravel the mysteries of Enceladus. Enceladus has all the ingredients required to support life, and is one of the reasons why Cassini was burned up in the Saturnian atmosphere. There was inadequate fuel in Cassini to maintain control of the spacecraft, and there was a possibility that Cassini would drift into Enceladus after the fuel was depleted. If there is an ecosystem on Enceladus, it could be adversely affected by any hardy microbes piggybacking on Cassini from Earth.